When the president comes to unveil a national initiative, it usually means attention that's welcomed by governors. In March, President Trump traveled to New Hampshire for his first visit since he won the first-in-the-nation primary two years ago, and he was announcing his plan to combat the opioid crisis, in a state where the rate of opioid-overdose-related deaths exceeds that of most of the rest of the U.S. Governor Chris Sununu, a Republican, should have been thrilled -- such a visit shows the governor has clout in Washington and the ability to change things for the better in his state. In this case, though, the trip nearly didn't happen. Sununu opposed the White House plan to roll out an opioid proposal that made big promises but offered limited new resources to fund treatment and recovery around the country. Ultimately, though, Sununu's desire to draw attention to the crisis outweighed his frustrations: Mr. Trump did end up unveiling some of the administration's new policy in a speech at the end of March in Manchester. But CBS News reports that a meeting between with the New Hampshire governor and the White House showed what Sununu saw as a lack of coordination and seriousness about getting states the money and support that they need for their drug policy programs. At the end of January, Sununu traveled to Washington D.C. for a meeting with the Office of National Drug Control Policy (ONDCP) to review a series of proposals that the governor had put together in conjunction with state experts to combat the opioid crisis, according to sources with knowledge of the meeting. Sununu has already introduced several initiatives in New Hampshire, including a statewide needle exchange program, recovery-friendly workplaces, and most recently, he secured $50 million from the New Hampshire Hospital Association to combat the crisis. The proposals Sununu showcased to then-acting ONDCP director, Rich Baum, who had requested the meeting, were ideas that could be replicated across the country. While Baum, according to sources, complimented the proposals, he indicated that no additional funding would be available to states at the time. The president, who in part won the New Hampshire primary because of his promise to tackle the epidemic, has repeatedly claimed that his administration is "pouring a lot of money" into the crisis. However, Mr. Trump called for the repeal of the Affordable Care Act, which provided New Hampshire with millions in additional funding to spend on opioid treatments in 2017 through Medicaid. He also declared the opioid crisis a public health emergency at the end of October with no new funding to support the declaration. Shortly after Baum broke the unwelcome news that no new funding would be made available to support any of Sununu's proposals, a health policy adviser on Trump's Domestic Policy Council, Katy Talento, joined the meeting to reveal what she considered good news: the White House had decided that it wanted to unveil their new plan to combat the opioid crisis in New Hampshire. Sununu, according to sources, was confused, because even though Baum had just said that there would be no additional funding for states, the President now wanted to appear in New Hampshire to discuss his new policies addressing the crisis. Sununu pressed the room on what was in the administration's plan – Talento and Baum could not say. A source briefed on the meeting said that a frustrated Sununu made it clear that "the president cannot come to New Hampshire without a plan that has substance." Sununu then reminded Talento that Mr. Trump had just referred to the state as "a drug infested den." "You can't come here with an empty bag and use the state as a prop," the source said, paraphrasing Sununu's message. Two sources described Talento as furious and "clearly unhappy" with Sununu's reaction, saying that if the governor didn't want to trip to happen, she'd have to rearrange the schedule. Talento is the same aide who urged the president not to declare the opioid crisis a public health emergency in October of 2017, as it would provide the administration with no new powers and funding. Talento did not respond to CBS News' request for comment, nor did the White House. "The governor does not discuss details of private meetings," Sununu's spokesperson Ben Vihstadt told CBS News in response to an inquiry about the meeting. "Whether Governor Sununu is talking to the President, White House officials, or substance misuse professionals in New Hampshire, his passion for advocating for the Granite State is evident. He remains committed to tackling this crisis head-on, and will never fail to speak up to ensure that New Hampshire always has a seat at the table because lives are at stake," Vihstadt added. Mr. Trump ultimately unveiled his opioid plan in Manchester at the end of March, making headlines for his proposal that prosecutors seek the death penalty for major drug traffickers. He touted additional funding to support those seeking recovery or treatment, too. 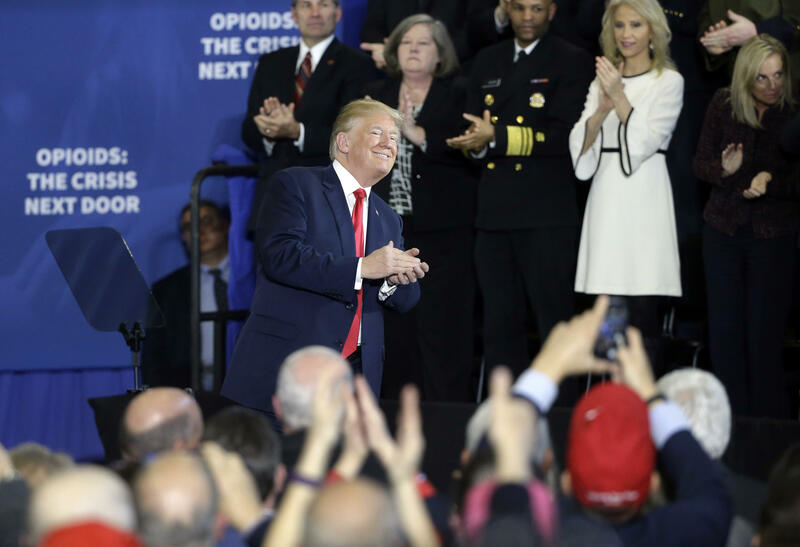 "Since then, we've worked with Congress to ensure at least 6 billion additional dollars, going through right now, in new funding in 2018 and 2019 to combat the opioid crisis," Trump told the audience that had gathered at Manchester Community College. "And we will be spending the most money ever on the opioid crisis." It's true that Congress allocated $6 billion towards the epidemic for 2018 and 2019, but it is not clear how that money will be spent yet – or how much money New Hampshire will receive. But it was evident some lawmakers from New Hampshire thought that funding fell far short. Democratic Senators Jeanne Shaheen and Maggie Hassan wanted to see over four times as much -- $25 billion -- to be allocated to the opioid crisis in the omnibus bill.